With Internet sync becoming more ubiquitous by the day, plenty of users are sending their data up to “the cloud” for easy access. But what about retrieving it? If you’re using any of Google’s online services—like Docs, Calendar, Reader, or Contacts—an easy solution is Golden Hill Software’s CloudPull. The $25 application—which runs as an applet in your menu bar—will sync with to up to ten Google accounts and automatically retrieve your Docs files, Reader articles, Calendars, and Contacts. You can view this information, organized by kind, in CloudPull’s viewer, and use Quick Look to preview it. The application keeps your older revisions, too; to restore one and access the full file, you can click the “Restore to file” button. If you have files you’d rather CloudPull not back up, you can add exclusion rules; you can also alter how often you’d like to perform your backups, how long to keep outdated revisions, and where to store your backup files. 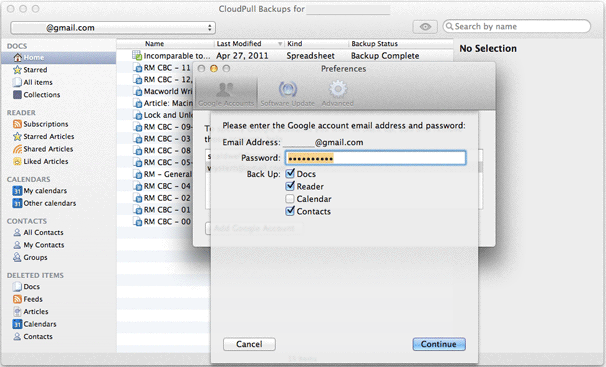 Even with occasional backup snags—group-shared text documents will occasionally fail to download—CloudPull is an excellent utility for rescuing your documents from the cold clutches of the cloud.